A.K.A. The Slasher!!! This replica of the 2550 amp is a great British Screamer used to produce some great GNR and Velvet Revolver Lead tones!!! 50Watts (switchable to 25) from 2 EL34's, Channel Switching, 3 distinctive tones ranging from clean to crunch to High Gain!!!! It also has a passive Effects Loop!!! Mounted in the classic styled Masrhall Small Box made by the Masters at the Mojo Custom Shop!!! Just a great rock Amp!!! 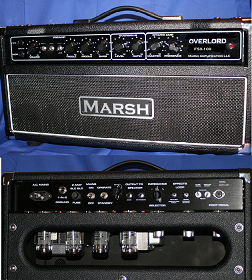 Like all Marsh Amps relicas, these amps are made to order and have a 6 week lead time! International Customers: All replicas and kits are shipped by Fedex or DHL Economy. Please email us your shipping address so that we may provide a shipping quote. Thank you.